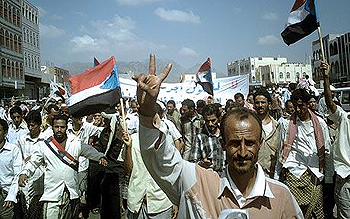 Yemenis protest the government in Radfan in October, 2009. In 2008, the American organization Human Rights Watch (HRW) reached out to me as a legal rights activist and asked me to help facilitate their mission in Yemen. They wanted to address human rights violations in Yemen, particularly the status of civilians displaced by the war in Yemen's northern Sa'ada district, where government forces have fought an armed group known as the Huthi since 2004. Despite the fact that I am a legal rights activist, I fell into the trap of suspicion and stereotyping: I considered everything American to be part of a political conspiracy that really has nothing to do with people's rights and freedoms. It took a fair amount of thought and a persistent desire to improve the human rights situation in my country to overcome my suspicion. I decided, cautiously, to accept their offer. I began to work for them through the Yemeni organization Hewar ("dialogue" in Arabic) on a trial basis. It has now been about three years since I began working with HRW. I have watched this organization operate through its dedicated and meticulous researchers in Yemen. The results of their efforts were a number of reports, three of which addressed the bloody war in Sa'ada. They also successfully created public awareness in Yemen about a number of terms that were absent from Yemeni lexicon, such as "civilians," "displaced" and "enforced disappearance." Through these reports, HRW managed to pressure, professionally and with great care, the relevant foreign and local parties to stop human suffering and allow the release of prisoners, based on the framework of the Yemeni Constitution and national and international law. One important report in 2008, "Disappearances and Arbitrary Arrests in the Armed Conflict with Huthi Rebels in Yemen," combined with the work of local Yemeni non-governmental organizations, led to the freeing of more than 50 detainees imprisoned illegally during the war in Sa'ada. There is no doubt that without the interaction and outstanding performance by local civil society organizations working on human rights in Yemen, HRW would not have been able to perform its role. Kenneth Roth, executive director of HRW, said, "Yemen has some of the Arab world's most accomplished, independent and professional human rights activists." My experience with HRW has helped me re-think the way I look at the relationship between the East and the West, and made me think more deeply about the best way to build bridges between them. Coexistence can take place only through working jointly towards a life of respect, justice and fairness for all. Certainly, culture and ideology play a role amongst the contradictions and tensions that sometimes mar relations between Muslims and the West. Accordingly, many groups focus on building bridges through literature, art, music and other intellectual and cultural means, which I respect. But we should not ignore the fact that we are attempting to build bridges between two communities whose relations have also been riddled with issues pertaining to rights, freedoms, security, justice and equality. Ignoring this fact while attempting to build bridges of understanding between Muslims and the West will only create bridges that can collapse at any moment. In order for these bridge-building attempts to achieve their goal, Western and Muslim communities should work to find strong common ground. For instance, they should partner in the human rights field where they can together ensure justice and equality. Right now, this is difficult to achieve at the government level, which is why nations aspiring for change should make use of civil society. My personal experience with human rights work in Yemen made me believe that civil society is the best way to create real change and create solid common ground between communities in the Muslim world and the West. Radhia Al-Mutawakel is a human rights activist and the director of Hewar Organization for Democratic Development in Yemen. This article was written for the Common Ground News Service: www.commongroundnews.org.